﻿ 5 Reasons People Shop at Your Small Business » Red Mango Marketing! It takes a lot to become an entrepreneur. You’re putting yourself out there and taking risks to do something you love. Running your own small business is certainly admirable, and can be both challenging and rewarding. It’s important to know that you are not alone when it comes to the ups and downs of owning a small business. That’s because there are over 28.8 million small businesses in the U.S. with 56.8 million employees. When people shop small, everyone wins! As a customer, it feels great to know that you are helping real people, even people you may know personally. You are helping to support their families and their dreams by shopping small. People love when you are able to tailor their experience. You have the ability to make each and every customer feel special when they do business with you. Plus, the expertise and passion you exhibit translates to helping customers find exactly what they need. No one knows your business better than you.Also, the relationships you build make you more approachable, as customers aren’t afraid to ask for suggestions or product details. The passion for your business means that you strive for higher quality products. Your customers know to come to you in order to find those unique products and gifts.You also have the ability to price your products and services to stay competitive. This allows customers to find better quality items at better prices over the big box stores. Small businesses create 2 out of every three new jobs in the U.S. and employ over half of people in the workforce.Your ability to provide jobs allows your community and local economy to thrive. As a small business, you typically go to other local businesses to buy materials and services to support your own business. You’re building relationships that help your community prosper.When people shop local, it also means that tax money stays in the community. You’re helping to fund local community improvement projects. If you’re going to pay tax, it might as well go to support local projects that impact your daily life. So give yourself a pat on the back. These are just some of the things that differentiate your business from those big box stores that make you successful. Now’s your chance to encourage your community to shop small. Start by enticing them to sign-up to your mailing list so you can connect with them right to their inbox – a place they visit every, single day. Let your customers know what makes your business special and how you can meet their needs. Next week is National Small Business Week (April 29 to May 5, 2018). So take some time to celebrate and check it out. The U.S. Small Business Administration will be hosting a free virtual conference including tons of great sessions to learn from. 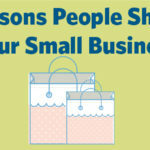 The post 5 Reasons People Shop at Your Small Business appeared first on Constant Contact Blogs. This entry was posted on Wednesday, April 25th, 2018 at 8:00 am	and is filed under Business Tips, Fresh Insights, News & Updates, Small Business. You can follow any responses to this entry through the RSS 2.0 feed. Both comments and pings are currently closed.